The Mathews Maritime Heritage Trail is a partnership project to preserve the valued coastal landscape, and tell the colorful history of Mathews County, Virginia's nautical heritage. Coordinated by the Mathews Maritime Foundation, this project was developed as a companion guide to the Mathews Blueways Trail Guide (pdf). The Blueways Water Trail follows 90 miles of water routes on five river trails. The East River Trail was chosen as a pilot project where numerous cultural resources were documented and mapped including historic sites (wharves, fish and crab packing houses, shipyards, marinas, tide mills, and plantations), environmental sites, and public access areas. We invite you to visit the East River, to enjoy the stories of our shared maritime heritage and to explore the river's natural assets. This interactive water trail map for the East River in Mathew's County, Virginia is intended to be used by both human powered and motorized watercraft. Use the navigation tools to move and zoom, at home or on your phone/tablet on the go. Take note of the legend icons to the right which are used on the map and indicate that there is more information available. Click on the maritime heritage icons to see photos and learn more about historical points of interest. Measure distances, find public access sites, and more. Create your own pdf map or print paddling notes before you leave home. The East River Water Trail in Mathews, Virginia, provides the opportunity to view historic wharf sites, tidal mills, gracious homes and estates, and miles of protected coves, marshes and tributaries, ideal for viewing wildlife. The River is about ½ mile wide at its mouth, and gradually narrows as one travels north. The lower portion of the River is wide and open to the south and the prevailing southwesterly breezes. Wave action can be substantial if it's blowing hard. The upper river is somewhat protected by the neck of land where Williams Wharf Landing is located, but depending on wind direction can still be exposed. The main stem of the river is about 5 miles in length. Put In Creek is approximately 1 ½ miles long. Safety is everyone’s responsibility. Although many of Mathews’ waterways and coves are suitable for beginners, there are also areas of open waters that are subject to tidal influence, high winds and strong currents. In addition, the Chesapeake Bay is notorious for its brief but violent thunderstorms. Winds within them can blow in excess of 50 knots. Be prepared! View these guidelines before getting on the water. Wear a properly fitted U.S. Coast Guard approved life jacket while on the water. Paddle with a group, not by yourself. Leave a “float plan” for your trip with a friend or family member. Know your route and any potential hazards in advance. Review maps, navigation aids, and weather conditions or marine forecasts before launching. Get off the water immediately if you see lightning. Dress appropriately for weather and water conditions, including air and water temperature, and carry a supply of food and water adequate for the length of your trip. Never paddle farther from shore than you are prepared to swim, and stay at least 100 yards away from moving vessels, piers, and other restricted areas. Bring a spare paddle or pole, and carry a signaling device (flashlight, horn/whistle, cell phone, a bright flag, or mirror). Do not stand up in your boat and avoid weight shifts that may cause capsizing. Do not carry more weight or persons than your boat was designated to safely accommodate. Weather Radio: It is advisable to carry a portable weather radio, available at electronic and marine supply stores. The NOAA local weather forecast is broadcast on a frequency of 162.40 MHz. Pay attention to special alerts on the approach of squall lines and lightning storms. Current Tide Information: The entire Mathews Maritime Heritage Trail is located in tidal waters. Check current tide information before heading out. America's Waterway Watch is a public outreach program encouraging participants to simply report suspicious activity to the Coast Guard or other law enforcement agencies. It encourages recreational users to adopt a heightened sensitivity toward unusual events or suspicious behavior encountered around ports, docks, marinas, river shorelines, reservoirs, beaches and waterfront communities. To report suspicious activity, call the National Response Center (800) 424-8802 or (877) 24-WATCH. In case of immediate danger to life or property call 911 or Marine Channel 16. Chesapeake Bay Smart Buoys are part of the National Oceanic and Atmospheric Administration’s (NOAA) Chesapeake Bay Interpretive Buoy System (CBIBS), water trail users call 1-877-BUOYBAY to hear a description of what the Chesapeake was like at that buoy location when John Smith traveled the Bay in 1608. These buoys also: deliver near-real-time information on weather and water conditions, such as wind, waves, and currents; collect and transmit many other kinds of data for scientific and educational uses, including water-quality indicators; and provide trail users with navigational information. Virginia’s recreational fishing regulations are divided into two categories – Saltwater Fisheries, administered by Virginia Marine Resource Commission (VMRC); and Freshwater Fisheries, administered by the Dept. of Game and Inland Fisheries (DGIF). A Saltwater Recreational Fishing License is required for both resident and non-resident to fish in the Chesapeake Bay and its tributaries. An annual saltwater license fee is $12.50 for both residents and non-residents. A temporary 10-day saltwater license can be purchased for $5.00. Information on fishing regulations, fees, and how to obtain a license can be found on the VMRC website. In Virginia, all boats propelled by machinery, whether gasoline, diesel, or electric, must be registered and titled. In addition, all sail-powered vessels longer than 18 feet must be titled. Registering your vessel in Virginia involves applying for a Certificate of Title as well as a Certificate of Number (Registration). A single application form is used for both, and is available from most watercraft dealers, the Department of Game and Inland Fisheries Offices, and agents who sell hunting and fishing licenses. Boat licensing information and forms are also available on line. All boats in Virginia, regardless of length, are required to carry one wearable (Type I, II, III, or V) USCG approved life jacket of the appropriate size for each person on board. In addition to the wearable life jacket, there must be at least one USCG approved Type IV throwable (ring buoy or seat cushion), for all boats greater than 16’ in length. The regulation to carry a Type IV does not apply to personal watercraft (PWC), canoes, kayaks, inflatable rafts or vessels less than 16' in length. Children under age 13 must wear a USCG approved PFD at all times. In Virginia, this rule is enforced by the U.S. Coast Guard and applies on waters over which they have enforcement jurisdiction. The Mathews Maritime Heritage Trail provides a unique opportunity to explore and learn about the cherished natural and cultural environments located throughout the county. In order to maintain these experiences for future generations, trail managers endorse the “Leave No Trace” principles for outdoor ethics. Leave No Trace, or LNT, builds awareness, appreciation and respect for natural and cultural resources, by educating users about methods for minimizing recreational impacts. As you travel along Mathew’s shoreline, remember to tread and paddle lightly and minimize the impact of your visit as much as possible. Note: All public landings are trash free facilities. Know your route and the limitations of yourself and your group. Carry the proper equipment and clothing. Notify someone of the time you intend to return. There are currently no designated campsites along the trail. Pack out all trash and leave access sites cleaner than you found them. Keep groups small and avoid trampling plants. Use biodegradable soap and stay as far away from waterway as possible. Clean fish at designated areas. Pick up litter and dispose of all wastes – including human waste -- in proper receptacles. Do not follow, approach, or feed wild animals. Control pets at all times and do not allow them to interfere with wild animals. Respect our natural and cultural heritage – leave all items as you found them. Keep noise to a minimum – enjoy the music of nature. Respect private property and the privacy of others. Virginia is fortunate to have a great diversity of habitats, as well as the plants and animals that inhabit them. Statewide, Virginia is home to 400 species of birds, 250 species of fish, 150 species of terrestrial and marine animals, 150 species of amphibians and reptiles, and a wide variety of aquatic and terrestrial invertebrates. The Mathews Maritime Heritage Trail highlights local sites for wildlife viewing, as well as those recognized by the Virginia Birding and Wildlife Trail. View wild animals from an appropriate distance. If animals change their behavior when you approach, you are too close. Stay clear of nests, dens, and rookeries. Do not touch or feed wild animals. Do not use calls or whistles, or try to rouse animals in any way. Limit your stay to minimize stress on the animals. Do not allow pets to interfere with wild animals. The Chesapeake Bay Gateways Network is a partnership system of parks, refuges, museums, historic sites and water trails spanning the Chesapeake Bay watershed. This linkage of Bay-related sites is designed to help the public access, enjoy, understand and appreciate the numerous resources and values of the Chesapeake Bay. Mathews County has been designated as a Bay Gateway site and Mathews Blueways is a designated water trail within the system. The U.S. Congress created the Captain John Smith Chesapeake National Historic Trail with more than 2,300 miles of water trail throughout the Bay area. This is the nation's first all-water national historic trail and will commemorate Captain John Smith's 1607-1609 exploration of the Chesapeake Bay. The National Park Service manages the trail in partnership with the Commonwealth of Virginia and many other organizations. 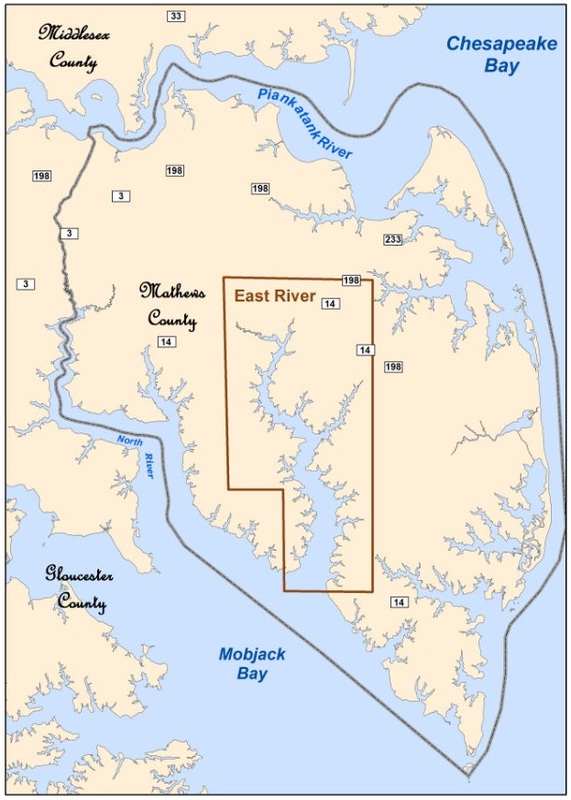 The Chesapeake Bay portion of the Mathews Blueways trail network follows the Captain John Smith route. This Blueways Water Trail includes five river routes, the Piankatank River, Gwynn's Island, Horn Harbor, and New Point Comfort. Launch sites and water trail guides are available online and at the Mathews County visitor center. The Gloucecster Blueways are particularly suited for small hand-powered craft such as canoes and kayaks. Gloucester County is located on the western shore of the Chesapeake Bay and offers more than 506 miles of shoreline. There are five tidal rivers, dozens of navigable creeks and a lake formed by a man-made impoundment, offering a scenic network of water and land trails to explore. The Virginia Capital Trail is a 52-mile dedicated multi-use trail connecting Richmond and Williamsburg along the beautiful and historic Route 5 corridor. The interactive trail map includes information on bike rental, restrooms, picnic areas, lodging, restaruants and more. Mathews Maritime Heritage Trail Committee, its members and employees, The Virginia Institute of Marine Science and anyone else whether associated with this project or not, makes no representation and specifically disallows any reliance on any statement contained herein. 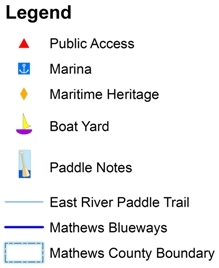 The Mathews Maritime Heritage Trail Committee assumes no responsibility or liability for injury or loss resulting directly or indirectly from the use of this Guide or paddling in the area.